Atmel Studio 7 came with a new version of the firmware for its JTAGICE3 debugger. The current version installed on our hardware is 3.25. The new version is 3.2a. We can't use the debugger without upgrading, but the firmware upgrade fails. The specific message given is as follows: "JTAGICE3 firmware upgrade failed, toggle power on tool and retry upgrade"
Of course, there is no way to toggle the power on the JTAGICE3 programmer except to unplug the USB and plug it back in. That has no impact. I've tried upgrading the firmware on two different devices, and both failed multiple times with the same error message. You may need to do a manual upgrade from the command prompt. There should be some threads about this here. I've been trying to do a manual update with no luck. You can see the error I've been running into below. I'd really like to know how to fix this since I've got a lab of students trying to work with these devices for a lab due in a week or so. Any advice on where to go next on this? May have to wait for someone from Atmel with that or maybe you can raise a ticket and point them to this thread. HI, I have the same problem, has anyone already found a solution? To use atfw from studio 7 you need to have the JTAGICE3 bound to Jungo 12, not 11. There seems to be no resolution to this post, does anyone have any updates or ideas. I have recently put AS7 on a new laptop and am trying to use the JTAGICE3 to debug, but as in this thread get the same upgrade message when it AS7 asks you to upgrade, the Jungo driver seems to be version 12. Having the same issue still with two jtagice3's. One has firmware version 3.31, the other 3.2a. Both fail to upgrade in AS, and fail to upgrade with the atfw.exe utility. The driver used is Jungo 12. Anyone have any luck upgrading? They worked not too long ago, <6 months; I'm not sure what version of AS broke this upgrade. Solved this issue. There seems to be an issue with the driver signatures for the JTAGICE3 when it is in upgrade mode. You might notice in the device manager that an error arises after the firmware upgrade is attempted and the device is stuck in upgrade mode. The solution is to disable Window's driver signature checking when you are doing the firmware upgrade. This guide details how to disable this security measure temporarily or permanently. Once signature checking is disabled, my firmware upgraded fine from AS7 in the automatic upgrade mode. I had this same issues with the latest AS7.0. It tried to update from 3.25 to 3.35. I was planing to do the driver signature disabling but decided to just try after normal Windows 7 boot. And the upgrade worked. I also had similar issues while upgrading EMBG firmware on SAMD21 Xplained Pro with the same AS7. SAMB11 Xplained Pr EMBG updated without issues. There still seems to be one problem. The updated JTAGICE is not anymore visible in AS6.2, which is used by my subcontractor. Is this to expected? No backwards compability? Yes and no; Atmel Studio 6.2 will need the Jungo driver versus WinUSB for Atmel Studio 7.0.1417. So does that mean that my JTAGICE will still work just fine with 6.2 on another computer, which doesn't have 7.0 installed? I'm having a similar problem with my JTAGICE3. I just installed the latest AS 7 (version 7.0.1417) on a Windows 10 laptop. When I connect to the JTAGICE3, it informs me that it has to update the firmware from 3.34 to 3.35. 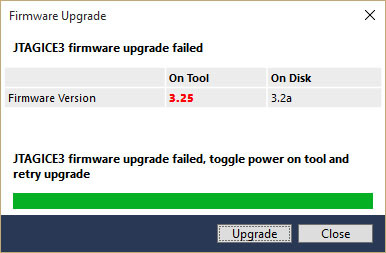 When I click Upgrade it shows plausible progress and says "JTAGICE3 firmware successfully upgraded". But the LED's on the JTAGICE3 look very unhappy, with only one light on, slowly pulsing between red and orange. When I unplug the USB cable and plug it back in, the lights go back to normal, but when I try to connect to it in AS it says it's still firmware 3.34 and needs to upgrade it. I have tried both methods of disabling Window's driver signature checking described in the link given above, but that has not helped. Any other ideas for making this work? 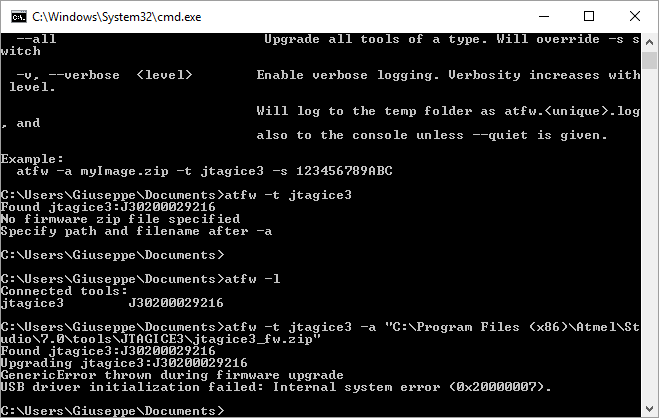 You can not update JTAGICE 3 with atfw.exe of build 1417. If you only have jtagice3_fw.zip of 3.35 in build 1188 or earlier version of AtmelStudio 7, it will succeed. Thanks very much for the response. Let's see if I understand this right. I do have another computer with build 1188. I need to use the 1188 build version of AS7 to install the 3.35 firmware on the JTAGICE3, using atfw.exe to do that manually. But I need to pull the jtagice3_fw.zip file from the newer 1417 build in order to get the 3.35 version. Correct? Also, how could I have found out that build 1417 won't update the JTAGICE3? Is that documented somewhere? And is that intentional, or a bug to be fixed in a future AS7 build? I also fell into the same situation as you and studied it myself. I thought this was a bug of atfw.exe by MICROCHIP. Any acknowledgement from the Atmel/Microchip gurus so we have hope of a fix in the future? I finally got all the necessary things in the same place at the same time. I used the AS7 build 1188 version of atfw.exe, and the 3.35 firmware file jtagice3_fw.zip for JTAGICE3 distributed with build 1417. It took a couple of tries and power cycling of the JTAGICE3, but in the end it succeeded in updating the firmware. It seems that after the first failed attempt and power cycling it needed some time for my computer to catch up with the "new" USB device before the firmware update procedure could work correctly. Thanks again for the help. Hope Atmel/Microchip gets around to fixing this sometime soon. I'm getting the same problem trying to upgrade JTAGICE3 with build 7.0.1417. Is there somewhere I can get atfw.exe from build 1188 without downloading & installing the whole installation package? I have the same problem: Atmel Studio 7.0.1417, JTAGICE3 with firmware 3.2a - inpossible to upgrade to version 3.35. Do I must install AS7 build 1188? copy "C:\Program Files (x86)\Atmel\Studio\7.0\tools\JTAGICE3" "D:\atmel\1417\JTAGICE3"
atfw.exe -t jtagice3 -a "D:\Atmel\1417\JTAGICE3\jtagice3_fw.zip"
Now I have ver 3.35 in my JTAGICE3 and it works with AS7.1417. In attachment - atfw.exe with friends from AS7.1188 and firmware ver3.35 from build 1417 (all necessary for updating). First answer "do manual upgrade on command-line" worked fine for me. So maybe an old bug returned to Atmelstudio? We had this before but worked nice recent upgrade(s). Still fails. The LEDs on the device change from being middle one solid red to the right one flashing orange / red. I have to power cycle to get it back again. Very frustrating. I've had the exact same issue. I ran the command prompt, with no luck. Then, without reconnecting the JTAGICE3, i ran the above command again. And it worked. I have same problem. Have you made it? I never got mine working again. Luckily I had a different programmer in the drawer (Atmel ICE) and was able to use that. I think I'll just buy another one to use as the new backup. Very disappointing that this is the service that Atmel (Microchip) now provide. Could you guys test the following update https://s3-us-west-2.amazonaws.com/atmel-studio/7.0.1652/as-installer-7.0.1652-web.exe and give your feedback? I have modified my JTAGEICE3 with a switch to supply USB 5V to the target as most of my designs are low power 5V and that saves me having to plug in external power. I turned on the 5V and clicked retry again, still failed. In frustration I clicked retry really quickly 3 or 4 times and bingo it suddenly worked! So from my view the problem was either you need target power rather than USB power (although in my case both are USB power via my extra switch), or you need to click the retry button 3 or 4 times really fast without power cycling the tool. Thanks for the info Charles! I had the same problem when I updated Atmel Studio (to this version: 7.0.1645). My JTAGICE3 has v3.35 firmware version, and it requires to update to v3.36. Then I tried to update to 7.0.1652 (version that Charles shared). It didn't work in the first attempt, but in the seccond time it worked. I suspect the the problem is the device gets a reset, and then the USB drops out briefly while it goes into bootloader mode and the upgrader doesn't wait long enough until windows re-enumerates the device. That's why it works the second time as the device is already in it's own bootload mode. The very first sticky at the top of the Atmel Studio forum has a link to it. The 3rd sticky has links to older versions. Disconnect AVR from the target board. In my system atfw.exe is located inside ..\Studio\7.0\atbackend folder. Therefore, copy jtagice3_fw.zip from ..\Studio\7.0\tools\JTAGICE3 to the folder \atbackend where atfw.exe resides. Run Command Prompt to enter command mode. Use dir command to move to the folder \atbackend. Atmel Studio 7.0.1417 did exist but it's not in the archive.